The gaming landscape has been lacking in quality skateboarding games for some time now, especially on PC. Not since the high times of Neversoft and the Tony Hawk series have we been given a skateboarding game we deserve. Thankfully, Roll7 has come to the rescue with OlliOlli, a 2d game – formally only on Playstation Vita - that is easy to pick up and play, but very difficult to master. You control a nameless skater has he travels from left to right across an area. 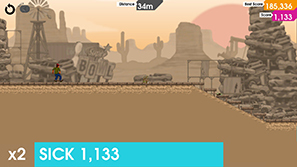 While is looks as if it could be an endless skater, it is not; each level has a finish line. You'll jump, grind and trick your way across imaginative obstacles in an attempt to reach the crowd of people at the end. The control is very tight and you have to time each grind and landing with minimal time for error. While this feels intimidating at first it soon becomes second nature. 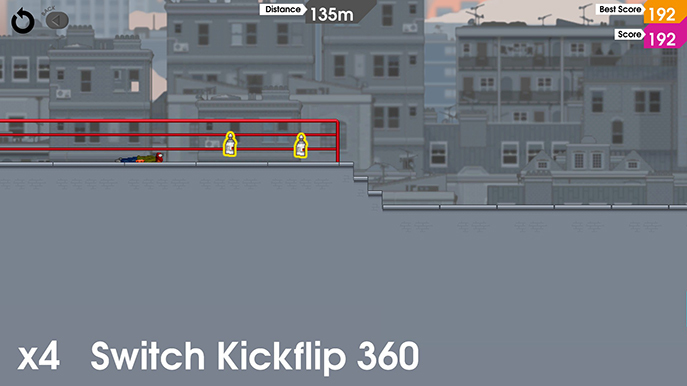 A game that relies this much on precision needs tight and comfortable controls and OlliOlli gets this spot on. There is a very clear and helpful tutorial which is essential. I went straight into the first level and it was instantly clear the controls aren't such that you can feel them out. You always begin each level with a rolling start at maximum speed and can press A to increase speed whenever it dips; two in total for maximum. Tricks and ollies are performed with the left stick. Think of a fighting game for an idea of how this works. You've got up and down for a simple ollie and left and right for kickflips. If you want to show off further you can perform down-then-right for a more complex trick. Further, holding down either left or right bumper will add a modifier, giving you a lot of tricks available. In mid air they also allow you perform 180s. It isn't just the tricks that you have to bare in mind. While grinds work in much the same way – a direction for a different type of grind, left and right bumpers for modifiers – timing becomes essential. There are different levels of the success of your grind. Move the right stick just before you begin the grind and you'll get a perfect. These range from sick through to sloppy and affect your combo score. Landing also uses this technique. You are required to press A when you land, and the closer you are to the ground the better your score will be. Get it too far off either way and you'll face plant, losing your combo and have to restart the level. While all these controls sound complex, it only took me about half an hour to get used to them and start to skate my way through levels cleanly and with style. 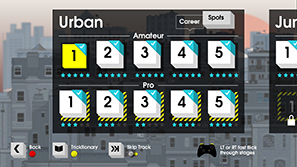 There are a few different modes in OlliOlli but the one you'll spend much of your initial time with is career. There are five worlds with five different amateur levels in each. You begin with only the first level available and you unlock the next simply by getting to the finish line. Each level provides you with five objectives that range from performing a specified trick, reaching a certain score or collecting items. Accomplishing these will unlock the pro level which provides a harder challenge. It is quite easy to cruise through the amateur levels to a point. The fourth and fifth worlds - the fifth especially - are incredibly difficult compared to the rest. I completed each of the third world's levels on my first attempt, but took a considerable time to beat the next ten levels. You are required to time every jump to perfection, land every grind with a perfect to get that speed boost needed to jump over the hazardous gap. It wasn't until five days after unlocking Neon – the fifth world – that I completed all five levels. I tell you, it was so satisfying to finally complete those levels. The difficulty spike in these later levels will be enough to put some players off from completing the career mode. This should not be a deterrent though. It was in the Spot mode where OlliOlli really clicked for me and presented it's case for being a game I'll stick with for a long time. Spot mode is a high score challenge across shorter levels where you compete for leader board superiority against other players. You can only perform one combo in each go so you have to string together tricks and grinds till the end of the level. I found myself replaying these many times in an attempt to climb up the ladder of players. Pressing select would instantly restart the level and as soon as I saw that first frame of a face plant from a failed landing I would hit it and start again. I got to number one in some of the levels though now I've been overtaken by a dozen or so players in each. This mode reminded me of Tony Hawk games, where you just played with a friend trying to get the higher score. It is very satisfying to end a long combo with a perfect landing. Doing so with any other type of landing would deduct a considerable number of points. There is a spot level for every amateur and pro level in career. Also, a daily spot runs on the Steam version; a mode where you can practice as much as you want but only get one chance to register your score on the leader board. The number of times I've practiced and achieved a fantastic score, only to mess up my very first grind on the real attempt.. I'm sure my neighbours could hear my frustration! 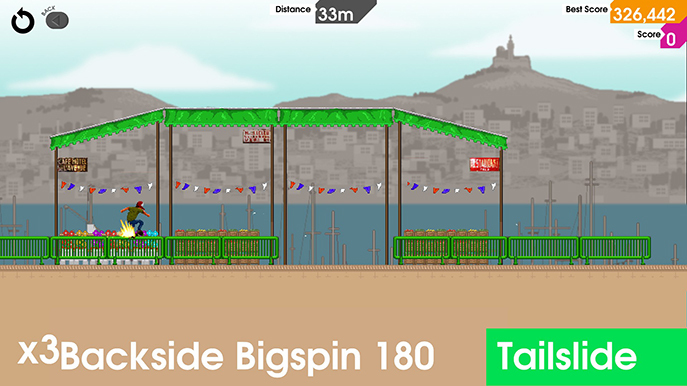 The presentation throughout OlliOlli is slick and easy to navigate throughout. While the artwork and music are both well made and implemented they did little for me. The backgrounds in each world are a little anonymous; the colour palettes aren't varied and just go missing as you concentrate on the foreground. The music also doesn't live up to the tension and excitement of the gameplay. The foreground is clear and the multiple routes you can take through each level stand out well. Your skater is animated very well, with each different trick identifiable and looking great. The face plants are nasty too. You'll bounce down steps and off obstacles with sharp, sickening sounds and end up a crumpled mess on the floor. I ran into a couple of issues so far. The second time I booted up the game it instantly crashed and upon rebooting I had lost my save data. While I was only forty-five minutes into the game at that point – and much of that was learning how to play – if it happened again now and I lost all my scores and unlocks I may not pick up the game again. Apart from that I've experienced the occasional slowdown lasting ten seconds or so and a couple of freezes. These freezes work themselves out without need to quite but it does break the pace a little. 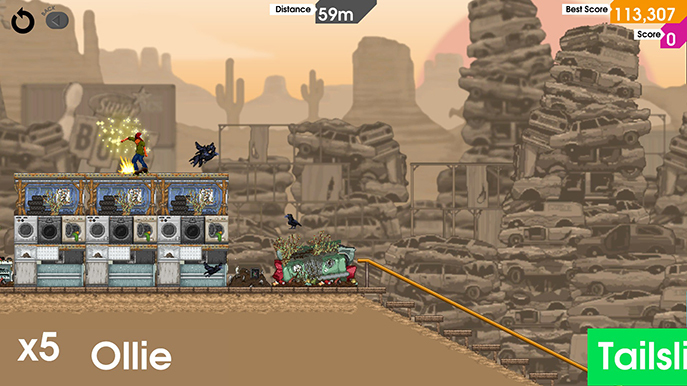 OlliOlli is as enjoyable as it is challenging. There is a huge range here that will provide enjoyable gameplay for players of all quality. And it is addictive. So very addictive. You'll want to increase your high score, rise up those leader boards, pick up every collectable and become the best. The instant restart of any level helps considerably to assist you in constantly improving as you learn the layouts, the best routes and the locations of each collectable. If you ever enjoyed a skateboarding game in the past you can't go wrong with OlliOlli. While it is a refreshingly new experience, there are enough similarities to those games to reignite your old desire when playing those games. 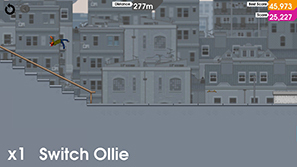 OlliOlli demands your full concentration but ultimately is a rewarding, engrossing and highly enjoyable experience.